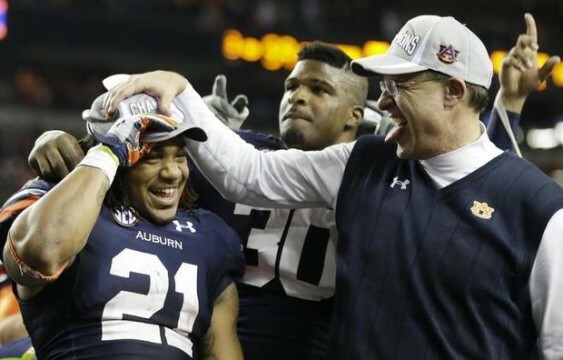 Auburn came out with BCS guns blazing within hours of beating Missouri to win the SEC Championship. Turns out they didn’t have to; thanks for that, Michigan State. Now they’re doing the same for Auburn running back Tre Mason, who is more of a man than you are, and who Auburn’s Athletic Department says deserves a trip to New York just as Auburn deserved a trip to Pasadena. Late Saturday night, Auburn sent media members a promotional one-sheet of sorts for Mason, which includes stats like his total rushing yards, 1,621, which is 79 yards more than Alabama’s Mark Ingram had going to the Heisman vote in 2009. Mason seemed to be campaigning for himself tonight as well. He struck a Heisman pose after at least one of four touchdowns he scored en route to a 304-yard rushing game, just three yards shy of the greatest single-game rushing performance in Auburn history. In the post-game press conference, both Gus Malzahn and Mason were asked about whether Mason should be considered a legitimate Heisman contender. say that one game can lose a Heisman. Can one game win a Heisman? teams have a chance at it, and you’re looking at one of those guys right here. TRE MASON: This is a personal goal of mine. Everyone has goals of their own. It was always a dream, you know, growing up, wanting to win the Heisman. I’m sure that every kid that played football, that’s one of their dreams. It’s hard to describe, the feelings that I’m having right now. You speak for all of us, Tre. So does Mason have a shot? Sure, you might think it’s too little too late. After all, both Pat and Bo earned their Heisman invites not only with stellar stats but with snazzy Please Pick Me pamphlets and postcards printed up weeks in advance. But, hey, this is Auburn, 2013. “Too little, too late” simply doesn’t enter into it. Auburn junior RB Tre Mason, who helped lead Auburn to the 2013 Southeastern Conference title and a potential trip to the BCS National Championship game, deserves consideration for the Heisman Trophy. Related: The proBotional material of 1985.